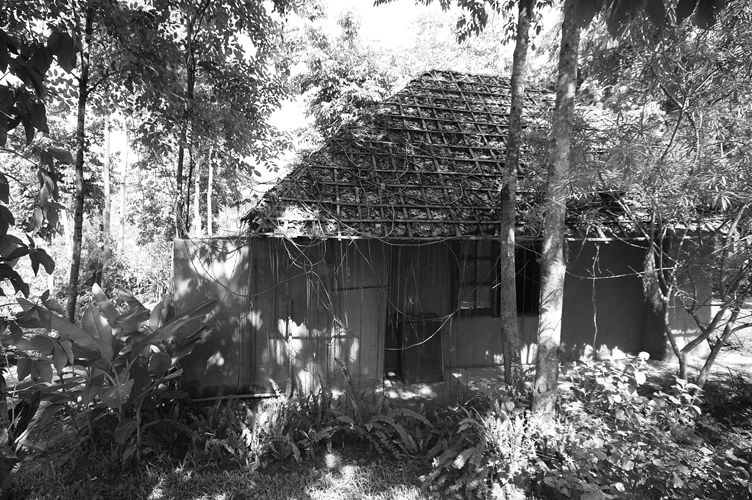 West of Pai in the village of Ban Mae Khong is Amy’s Earth house, the first adobe building in Pai. Built in 2004 she has since expanded to seven earth bungalows and a dorm building, and runs it as a guesthouse for the increasing numbers of tourists (mostly Thai rather than foreigner) heading north into the green valleys and forested hills of Mae Hong Song (Thailand). She never really intended to run a guesthouse, she wanted to invest in a property and build a home that would be robust enough, and in a good location, to cope with the changing weather of the region. She wanted a house that would last. Pai has been hit by heavy floods in recent years which damaged a lot of property in the town, and any house here has to cope with the heat of the hot season and the humidity and rain of the wet season. Amy (a Thai originally from Bangkok) was inspired to build adobe by her boyfriend at the time, an American. He had volunteered on a couple of natural building projects in the region and, with Amy, organised a group of volunteers to build on Amy’s land. It took just six months to complete the house; making each adobe brick themselves from clay on site using a wooden frame, to fitting the roof. In Thailand this is considered a long time to build a house and they deliberately ‘did not work all day because it is too hot, so we just did what we wanted to’. They were also hampered by running out of water at times (the site had no infrastructure or facilities), which meant they could not make the bricks or mix the clay mortar. Amy is critical with the obsession of speed in building because locally this has led to a preference for concrete houses which ‘can be finished in a week’. For her, building cheaply and naturally meant taking her time and having fun by working in a group. She notes it would be almost impossible to do on your own and that such builds have to be a collective process otherwise it would be a long and lonely journey. This raises fundamental questions about how we currently build our homes and often view them as individual rather than more collective projects. Part of the fun was in using the body in the build – not just as labour but in feeling and touch. They mixed the clay with rice husks using their feet and ‘we used our feeling, touching to know’ with their hands when the clay was the right consistency. The sense of touch is important in earthern building even after completion – the soft curved walls invite interaction, in a way concrete walls do not. During this first build Amy learnt from her boyfriend and has never had any further training. She has simply experimented and asked advice when she needed it. She also identified parts of the build – the plumbing in the toilet – where she wanted more expertise and employed locals for those jobs. The interest her house generated encouraged her to build more. Though this time she trained some locals and paid them to build the guest bungalows. She said training them adobe building was relatively easy, though at first they thought the method quite odd. Thee buildings, beautiful and peaceful to stay in, are a mix of influences and methods, and for Amy nothing is ever finished. She continues to experiment, improve and evolve her houses. 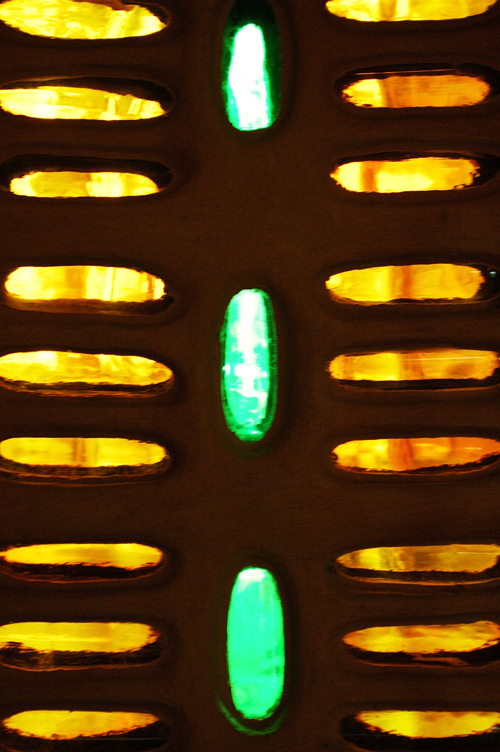 Eco-building in this context is a fusion of ideas from around the world complicated by the way natural methods are mixed with vernacular style and modern building techniques. Thus, the original adobe building here was inspired by American tradition but Amy is about to experiment with new thicker thatch roofs designed and used by Chinese in a local village (Ban Santichon). Non-natural materials have been added in where the eco-approaches were proved somehow to be deficient. Thus the bungalows now incorporate a tin roof (sandwiched between a woven bamboo ceiling and external leaf layer) to increase waterproofness and reduce the debris that was falling internally from the original grass roof. 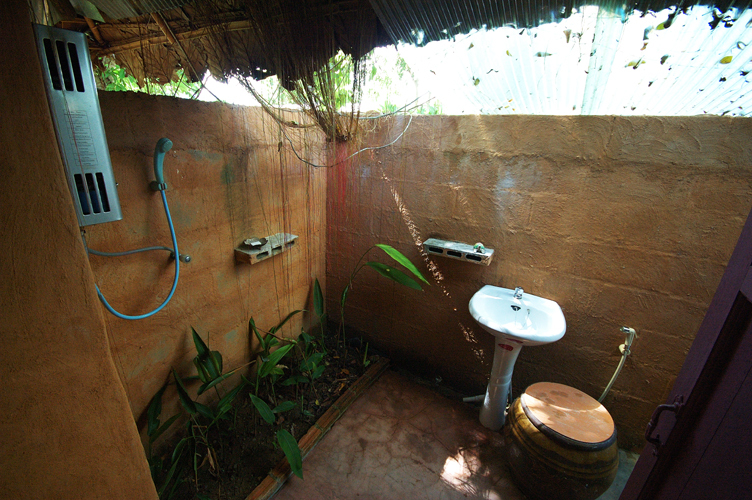 The bathrooms, which are open-air now have cement block walls because the original bamboo surrounds did not give enough privacy for guests. The new dorm building has a roof of metal beams and aggregate-fibre tile roof. This last material choice was mostly one of cost. Wood is expensive and the prefered wood – teak – is now in short supply because of excessive logging and recent government strict regulation of its use. The result is an interesting mixture of methods, a pragmatic approach to eco-building. The irony of this approach was that because the local earth Amy used to build he houses is grey ‘it looked like concrete from a distance’. So even the natural elements were not perceived as natural by visitors. Her solution was to paint them an earthy orange. The implication being that eco-houses have to look eco to be believed. This creates an interesting disjuncture. On the one hand if we want eco-buildings to become mainstream we tend to adapt them to fit into existing expectations of architecture and home. On the other hand, if they don’t look different enough people don’t believe they are special in any way and miss the broader environmental message. Amy’s Earth House and her earth bungalows were made affordable by building in a place where until recently land was relatively cheap, using adobe which is easy to learn quickly and to pass on which reduces the need for skilled labour, and using volunteer labour. 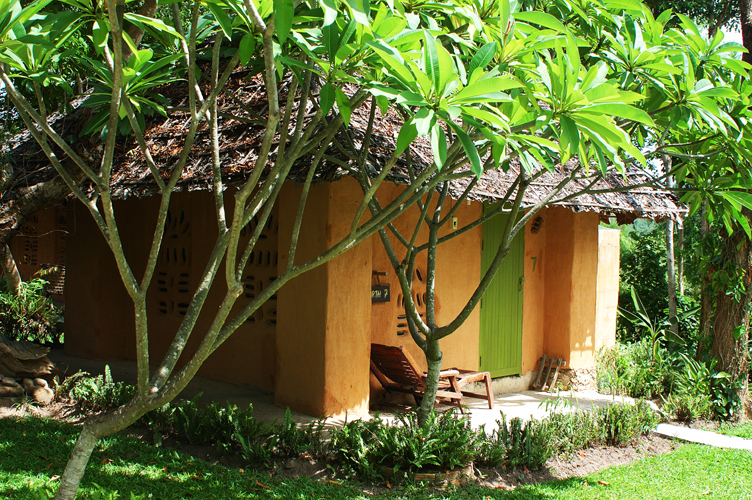 By dramatically reducing the amount of wood used in construction, a radical move away from the Lanna all-teak buildings of the area, then costs are further reduced. There are no structural beams in the adobe walls, just the roof beams and the wood of the window frames and doors. 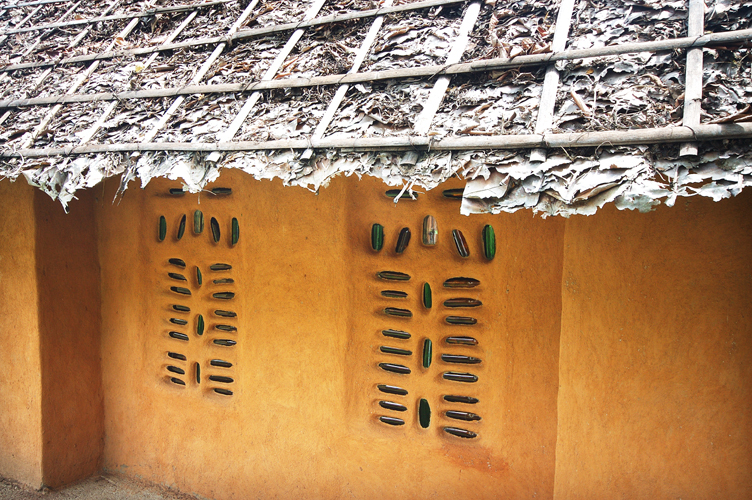 Clay was used from the site, rice husks brought cheaply from a local village, as were secondhand doors and windows. Amy has also deliberately limited the size of her house and the bungalows partly because ‘Thai people are outdoor people so we have lots of outdoor space’ and partly to keep life simple. Her building has also been a process of making additions over time as she could afford it – modular building. The guest buildings are also designed to reduce the need for extensive draining systems by placing the shower head directly over a trench of plants which then directly benefit from the waste water. 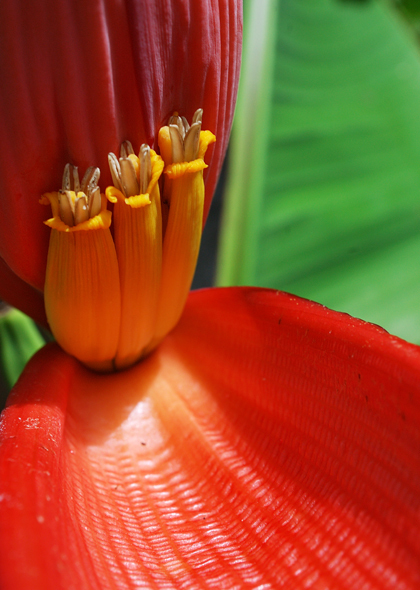 It has the additional effect of brining nature right into the home. It encourages interaction with nature at a rather intimate moment – when you are washing – and in is this way challenges our often sterile view of cleaning and reminds us of the environment in which we live. Although being able to live much of our daily life outside is weather dependent, perhaps if our houses were smaller and the boundaries blurred between our homes and nature, we might engage with nature more. Much of our desire to build large fortress-like houses is cultural – a sign of wealth and status, or a fear of society. Perhaps we need to learn not to shut out quite so much of the environment from our homes? Any problems Amy has encountered tend to involve the maintenance of the buildings, that some of the walls need patching every few years and the leaf roof only lasts three years. As Pai has started rapidly expanding the electricity supply has become less reliable (she is attached to the mains) which in turn cuts out the water pump. But Amy navigated the planning permission (required for business premises) with ease and has found the regulatory system supportive of her building. 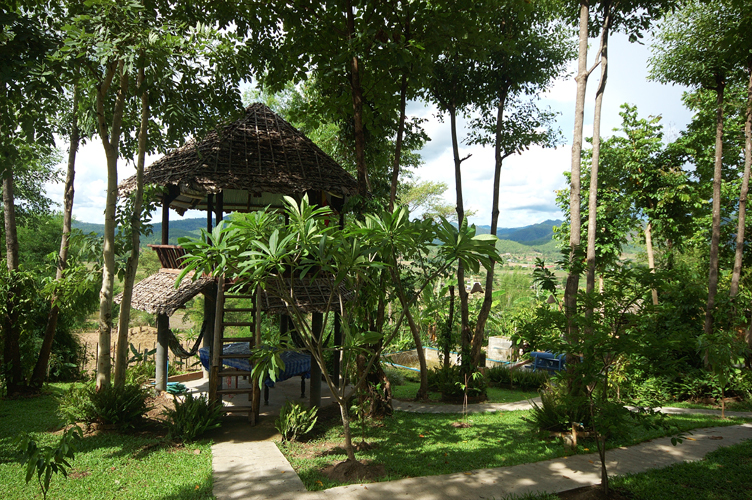 Amy’s house has helped spread the appeal of natural building in northern Thailand. Many have wanted to replicate her, but with mixed success. There is another adobe guesthouse in Pai inspired by Amy’s, another individual house built by the workers Amy trained, but there are also unfinished projects or buildings were they built with adobe bricks which were too small and their walls collapsed, or they attempted it alone and discovered quite how long it takes. So while an eco-building can serve as an inspiring example which helps spread environmental ideas, there is also a need for training or detailed information in order to ensure people’s first foray into eco-building is a success. One such group offering this training in Thailand is Baandin. As Amy herself said, eco-building in Thailand remains the preserve of the middle classes and has yet to be understood as an affordable methods for the ‘grassroots’. 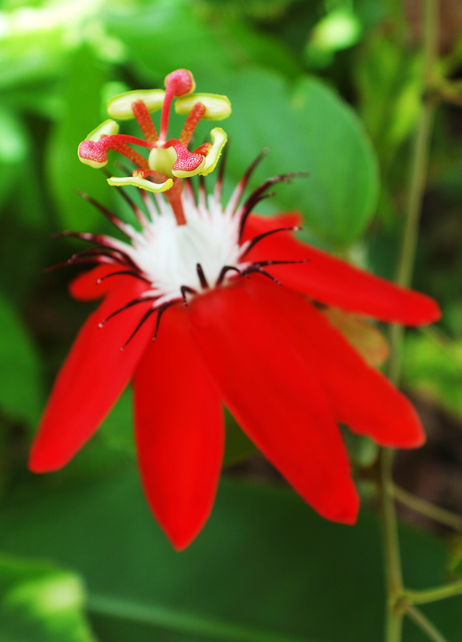 If you would like to visit Amy’s Earth House visit her website: http://www.amyshouse.net/, or email: emika_bibey@yahoo.com, or call (+66) 086 190 2394. There are several buses a day from Arcade bus station in Chiang Mai, and minivans almost every hour. It takes about three to four hours from the city. 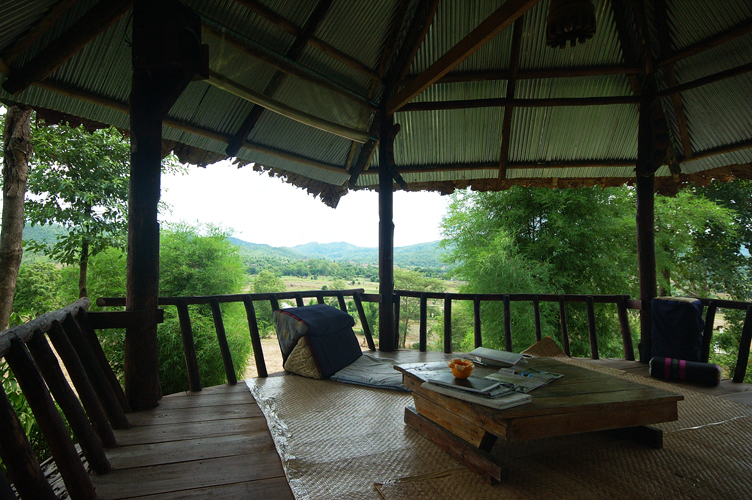 Once in Pai it is a further 3.5 kms west to Ban Mae Khong. You can either hire a motorbike or take a motorbike taxi (they are willing to do the trip with your luggage too – a rather interesting experience if, like me, you have a large backpack!). Amy’s rates vary according to season but at their peak are an affordable 16 British pounds a night for a whole en-suite bungalow. Amy offers an all day food and drink service (excellent mango smoothies!) and is a brilliant guide to the area. Wow looks pretty cool, cant believe some of the stuff you have done by yourself. 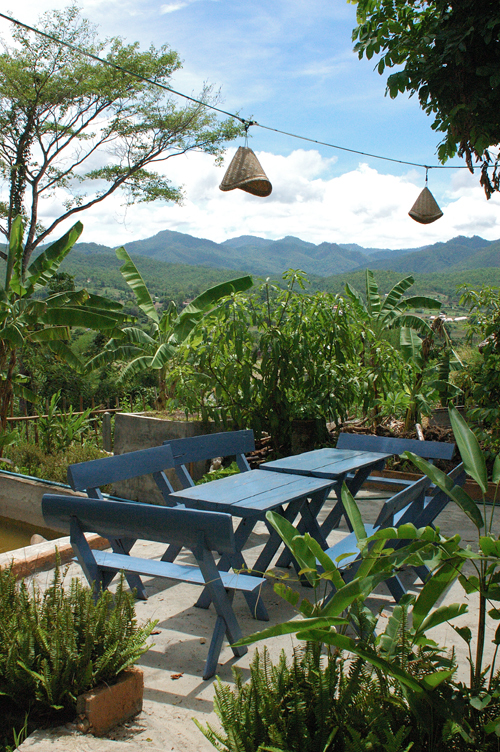 Next time i go to pai I will have to come and have a look. Amy has since left Pai and now lives in Chiang Mai. 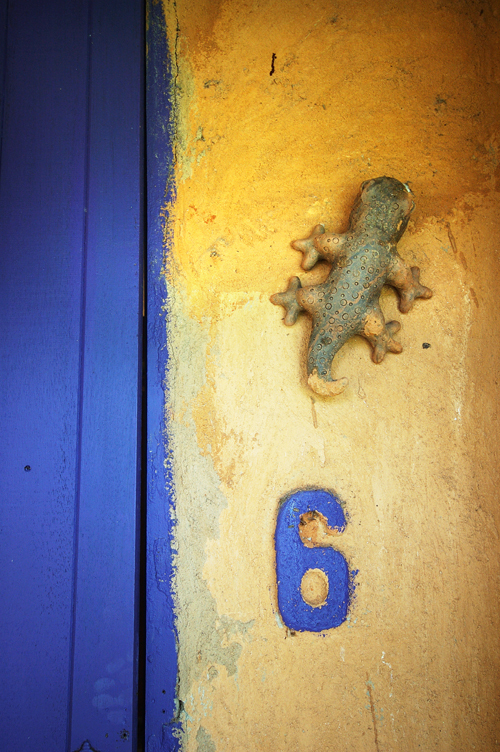 Rob and Netty have taken over her adobe houses and can be conacted under +66(0)68493865. We are continuing to support the eological image of Amy´s. 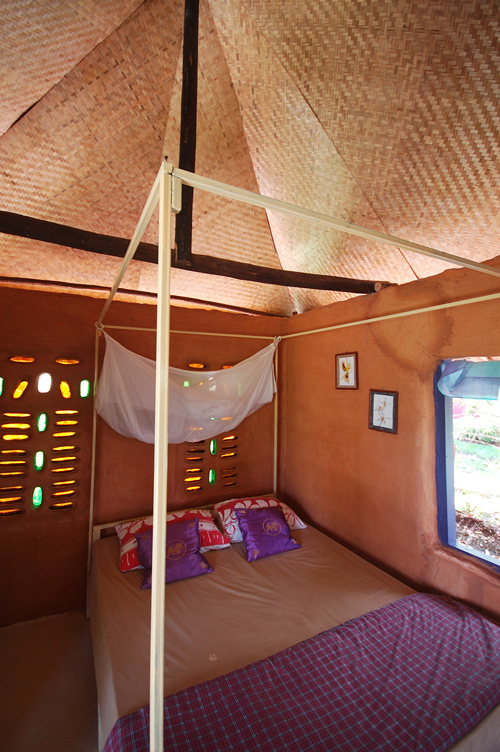 The Earth Houses are not, as stated painted orange to make them look more natural. They are, in fact, coated with a stucco made from chinese mud. This is renewed regularly and helps to give the underlying mud bricks a longer life.